At Simei 2013 Sacmi will showcase a reliable, efficient machine range designed to provide the wine-making and drinks industries with outstanding product quality Efficient, reliable and, above all – thanks to its aseptic characteristics – designed to ensure perfect product integrity. This, in a nutshell, is the new aseptic rotary filler for Bag in Box containers, to be presented for the very first time by Sacmi at Simei 2013, the international wine-making machine fair to be held in Milan from 12th to 16th November. Several design aspects allow Sacmi to offer the outstanding process innovation that is generating market-wide interest. To begin with there is the filling chamber, designed to maximise safety with regard to the parameters that ensure aseptic conditions during production. These components, which govern the filling process, have been built by Sacmi in keeping with a ‘hygienic’ design process that ensures they are easily washed and sanitised. 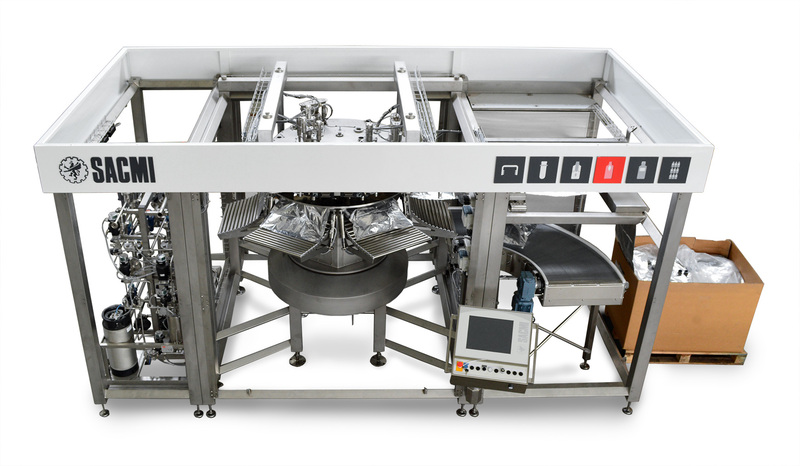 The heart of the machine is the rotary table which manages all the aseptic filling tasks in six separate steps: bag loading and unloading, spraying of cap and feed gate with hydrogen peroxide, sterilization, removal of cap, filling and capping. A solution not just suitable for oenological products but also soft drinks, dairy drinks, sauces, fruit syrups etc and one that can be used with bags ranging in size from 3 to 20 litres at output rates of up to 850 pieces/hour. 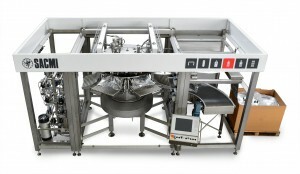 Compactness, aseptic conditions, extremely short sterilisation times and solutions designed to prevent not just contamination but also any product leakage: these, then, are the key characteristics of the machine Sacmi will be showcasing at Simei together with other solutions that have already been tried and tested on the market, such as the integrated filling unit, first presented in 2012. Already marketed extensively overseas, this Sacmi brand solution is now steadily increasing its market share even in the “old world” thanks to design specifications that ensure both maximum economy and absolute product integrity. Designed and built at Sacmi Pakim – the Sacmi Group company that specializes in designing, producing and marketing packaging solutions – Bag in Box lies at the core of a comprehensive turnkey range that covers the entire packaging line, from the filling-packaging combi unit, made entirely of stainless steel, to the handle application and pick and place units. The key strength of this integrated filling-packaging unit, which combines all the functions needed to create the characteristic Bag in Box packages – from carton forming with hot melt closure to filling, including in-box bag insertion and box closure – is the high degree of automation, which allows efficient control of 1.5, 2, 3, 5 and 10-20 litre bags. The unit is user-friendly, requires no supervising worker and stands out on account of a design that, thanks to vacuum technology, allows evacuation of air prior to filling: moreover, a special pouring tap and gravity-drop bag ensure the product never comes into contact with air or any other oxidant or contaminant. The same filling valve, together with the as-standard software for automatic machine steam-cleaning, thus ensures complete “ultra-clean” management of the entire process. Hygiene, precision filling, a total absence of oxygen in contact with the product at both the filling and pouring stages: just perfect, then, for a product such as wine, which, once opened – simply on account of contact with the atmosphere – risks seeing its organoleptic and taste qualities altered. And since the market demands both painstaking attention to quality and constant cost control, the Bag in Box solution is highly attractive because the pack is made of low cost materials such as plastic film and cardboard. Wine makers have already shown widespread appreciation of Sacmi Pakim solutions, as the numerous complete filling/packaging plants installed by all the major Italian wine producers clearly demonstrate. The main Bag in Box customers? Not just producers and final consumers, but also restaurant owners: they can continue the Italian tradition of pouring directly to the customer without compromising on product quality while enjoying bulk buying. There are also evident advantages in terms of transport and storage thanks to the shape of the packaging and the materials used to make it, less fragile and lighter than glass.. 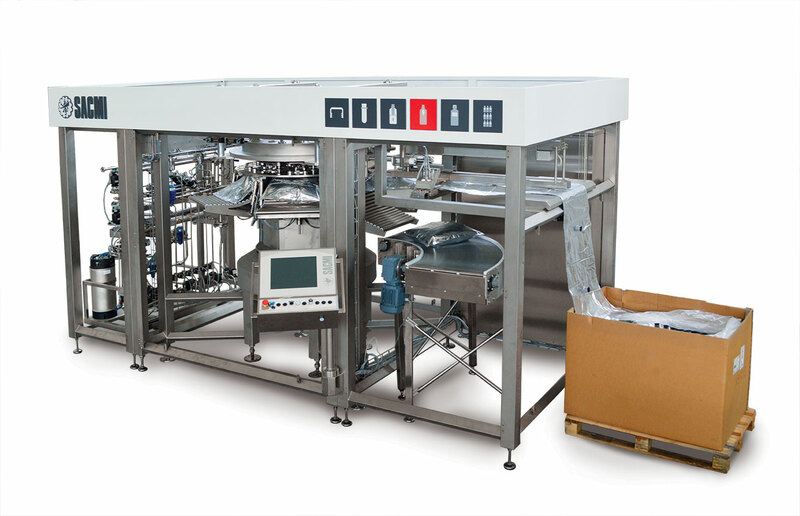 Completing the Sacmi range is the semi-automatic Fillbag, model, made entirely of stainless steel, suitable for sizes from 1.5 to 25 litres and providing output rates of up to 300 pcs/hour. Once again, it is the design specifications that make the difference; automatic machine sanitisation (steam or chemical), a filling system with an ultra clean valve featuring flow rate measurement and a PLC to control working functions. There are also various devices that protect the product from oxidation (a key factor in delicate products such as wine), allowing producers to guarantee oxygen absorption values of less than 0.5 ppm.